Energy can be a mysterious commodity. We all use it, yet it's not often clear as to how our usage converts into what we pay. Enter Direct Your Energy, our new easy-to-navigate usage insights tool that depicts and analyzes your energy usage, helping you make informed decisions that can help you use less. 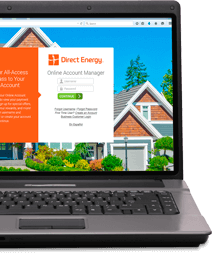 Direct Energy is leading the way in energy innovation, starting with our new platform within the Online Account Manager (OAM) called Direct Your Energy. This custom suite of energy usage insights tools helps you see, understand, and manage how you use energy in your home to help make sense of your charges, and enable you to lower your overall usage. We really are the energy company that wants you to use less of what we sell. Using Direct Your Energy, you'll make smart choices that help you get there. Receive a high-level view of your current energy performance. Does it look like your energy usage is going up this month? Or have you been cutting back on the laundry, and noticing some savings? Your energy snapshot will help you make adjustments if needed so that you are in total control. You'll also benefit from a seven-day weather outlook and how that could impact your bottom line. Direct Your Energy features a color-coded Heat Map Calendar that visually depicts your energy usage for particular days. Each calendar day shows the amount of energy consumed via this easy-to-recognize color scheme so you can identify what may have contributed to a high or low day, and adjust your future usage accordingly. The only exception for these indicators is whether or not your plan includes free power Saturdays and free power Sundays. These graphs provide you with the option to view your energy usage by day, week, month, or year. Temperatures, whether high, low, or average, are overlaid with the usage to provide clarity on your consumption. Our visual map allows you to get virtually any look at usage you desire. It's just another way we help you figure out how to use less energy. You can now see clearly behind your own energy charges. But how does your usage compare to those similar to you? The Home Comparison tool generally reflects your home's energy usage to that of homes like yours, so you can see if you are using more or less than those guys. You'll not only see how your overall usage stacks up, but a breakdown of the individual elements that contribute to your bill, like your heating and cooling. Running your A/C on high all day? Or perhaps you hosted a party. Maybe your son is home from college and running your washer and dryer non-stop. Direct Your Energy provides Usage Anomaly Alerts, an alert message feature for abnormal usage patterns. These email alerts are triggered when your actual usage is considerably different than what would have been predicted given weather conditions and your historical usage patterns. Plus, if the source of the anomaly can be identified, such as your HVAC, you'll be notified immediately so that you can adjust your usage. The Predictive Weather Overlay is unique to Direct Energy and not offered by any other energy supplier. This planning tool features a weather forecast that not only predicts temperatures, but also mathematically estimates your future bill amount based on your historical usage measured against the predicted weather. Based on upcoming conditions and predictions, you can proactively adjust your usage to potentially lower costs. Check our extensive list of Frequently Asked Questions to find the answers you're looking for. Please note: The latest features in OAM are only available to postpaid and residential Texas customers with smart meters.